The lovely gallery, Eventide, run by Teri Canelle Eramo is sponsoring a new summer show "Open Spaces". The opening is Saturday July 14, 2012 from 5pm to 8pm. The gallery is conveniently located on Route 133 a few places down the hill from The Village Restaurant. I'm planning to visit the opening and hope to see you there. A few of my new paintings will be showing at Eventide Studio & Gallery this summer. 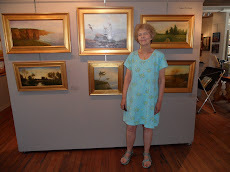 Visit Eventide Studio & Gallery in magical Essex, MA to view my paintings and to meet Teri.